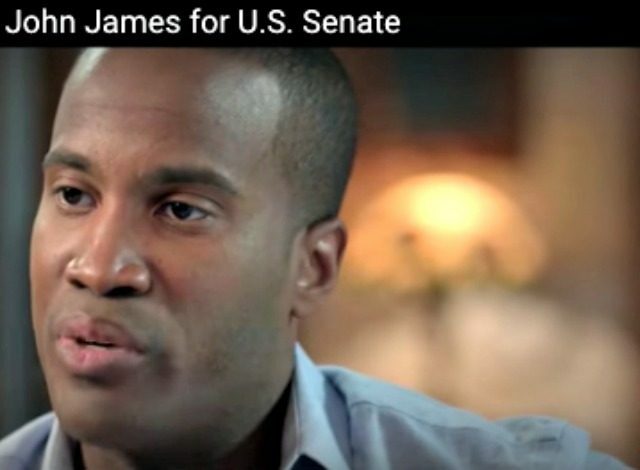 John James, a Republican candidate in the U.S. Senate primary race in Michigan, is a combat veteran, a businessman, and an unabashed pro-life conservative and constitutionalist who says President Donald Trump is keeping his “promise” to Americans. James is aiming to win the Republican primary on August 7 and ultimately run against longstanding Democrat Sen. Debbie Stabenow in the general election in November. Trump won in Michigan in 2016 – the first time the state went with the GOP nominee since 1988. In an interview with Breitbart News, James says being frank and up front about his conservative views, when other Republicans prefer to be seen as “moderate,” is the only option for him. According to Right to Life of Michigan, James is the only pro-life candidate running for the Senate in that state. One of James’s opponents in the primary race is Republican Sandy Pensler, a venture capitalist who has also taught at both Yale and Harvard. In 1992, Pensler ran for Congress as a pro-choice Republican who also endorsed government-funded health care. According to the Detroit Free Press, Tom Shields, a spokesman for Pensler, said his candidate’s position has “evolved” on the issue of life. James bemoans the fact that Washington Republicans keep funding Planned Parenthood. James says he opposes the use of taxpayer funds to perform or promote abortions, or to fund organizations such as Planned Parenthood. James says his convictions inform his values. James asserts his background as a combat veteran, a businessman, and a husband and father help him to relate to a wide range of people in Michigan – something Stabenow lacks. An African American, James welcomes the opportunity to share his conservative values with all Americans and suggests black Americans who might be tempted to vote for Stabenow to ask themselves if they believe the quality of their life is better since the first time they voted for her. The conservative candidate says he believes voters want a representative who relates to them. James reflects on Trump’s mission on the eve of the president’s visit to Michigan Saturday. Our president is going to put maximum pressure on Korea economically in order to get them to the table, and now we’re seeing that we’re beginning to end the Korean war. Our president is holding China accountable for their intellectual property theft and their currency manipulation, getting them back to the table to negotiate fairer terms. Our president recently hosted the French president from the nation that is our oldest ally in this country which continues to advocate for Americans all over the world in that way. Our president hit Syria twice in the past year for their atrocities against their own people, showing global leadership and the fact that you can’t gas your own people. At home in the U.S., James says Trump is fulfilling his promises by bringing about tax reform and cutting back regulations. “Our president is standing up for folks back home – and especially in Michigan here – and saying, ‘Hey, look, businesses, you need to make sure you’re taking care of your workers and doing everything you can to bring jobs back,’ but he is also doing his job by championing tax reform and putting money back into the hands of the people who earned it and allowing those same businesses to now compete on a level playing field,” he observes.